Pain au chocolat, oui oui. Well, Christmas is over. But the “holidays” aren’t, since NYE is just around the corner. All the gifts have been ripped open and kids are counting down to next Christmas, but it’s still winter, a lot of people are still on vacation, and what better to make for breakfast but a delicacy filled with butter and chocolate? That’s right. Croissants. Croissants are awesome. Flaky, buttery, delicious. When I was about 9, I was in a ballet class and the teacher, Margie, took us all (my class and her two other classes) to practice for a big performance at the dance room in Adelphi University. It was so exciting, except I had to be there at 8:30 a.m. on a Saturday. So on the way, I stopped with my mom and got a chocolate croissant and orange juice. I find they do make mornings much more manageable, so the French are definitely on to something. Maybe it’s all that butter? Since then, croissants (especially ones with chocolate) have been a treat that I’ve only indulged in rarely, but when I do indulge I always think, “Hot damn, I need to have these more often, maybe even make them myself!” And I never have. Until now! ….a chocolatine (IPA: [ʃɔkɔlatin]) in southwestern France and in French Canada, is a French pastry consisting of a cuboid-shaped piece of yeast-leavened laminated dough, similar to puff pastry, with one or two pieces of chocolate in the centre. Pain au chocolat is made of the same puff pastry variant as that for a standard croissant. Often sold still hot or at least warm from the oven, they are commonly sold alongside croissants in French bakeries and supermarkets. A croissant (French pronunciation: [kʁwasɑ̃] ( listen), anglicised variously as /krəˈsɑːnt/, /kwɑːˈsɑːn/, etc.) is a buttery flaky bread or pastry named for its distinctive crescent shape. It is also sometimes called a crescent or crescent roll. Croissants are made of a leavened variant of puff pastry. The yeastdough is layered with butter, rolled and folded several times in succession, then rolled into a sheet, a technique called laminating. Croissant pastry can also be wrapped around any praline, almond paste or chocolate before it is baked (in the last case, it becomes like pain au chocolat, which has a different, non-crescent, shape), or sliced to admit sweet or savoury fillings. In France and Spain, croissants are generally sold without filling and eaten without added butter, but sometimes with almond filling. In the United States, sweet fillings or toppings are common, and warm croissants may be filled with ham and cheese or feta cheese and spinach. In the Levant, croissants are sold plain or filled with chocolate, cheese, almonds, or zaatar. In Germany, croissants are sometimes filled with Nutella or persipan; in Southern Germany there also is a popular variety of a croissant glazed with lye (“Laugencroissant”). In Switzerland the croissant is typically called a Gipfeli which typically has a crisper crust and is less buttery than the French style croissant. In some Latin American countries, croissants are commonly served alongside coffee as a breakfast or merienda. These croissant are referred to as medialunas (“half moons”) and are typically coated with a sweet glaze (“de manteca”, made with butter). Another variant is a medialuna “de grasa” (“of lard”), which is not sweet. In a large mixing bowl stir together flour and salt. Cut the cold butter into ½-inch-thick slices (not cubes). Add the butter slices to the flour mixture; toss till butter slices are coated with the flour mixture and are separated. Pour ice water over the flour mixture. Using a spoon, quickly mix (butter will remain in large pieces and flour will not be completely moistened). Turn dough out onto a lightly floured surface. Knead dough 10 times by pressing and pushing dough together to form a rough-looking ball. Shape dough into a rectangle (dough still will have some dry-looking areas). Make the corners as square as possible. Slightly flatten dough. Working on a well-floured surface, roll the dough into an 18″ x 15″ -inch rectangle. Fold crosswise into thirds to form a 15″ x 6″ -inch rectangle. Give dough a quarter turn, then fold crosswise into thirds to form a 5″ x 6″ -inch rectangle and to create 9 layers. Repeat the rolling, folding, turning, and folding process once more, forming a 5×4-inch rectangle. Wrap dough with plastic wrap. Chill for 20 minutes. Repeat the rolling and folding process 2 more times. Before using, chill dough for 20 minutes more. Roll out into approx. 15″ x 18″ rectangle once again. Preheat your oven to 400 F. Mix together egg yolk and milk in a small bowl. Take the chilled dough that’s ready to be used and cut it into pieces that measure about 12″ by 3″, roughly. Spread semi-sweet chocolate chips along the center of one of the rectangles, leaving spaces on all 4 sides. 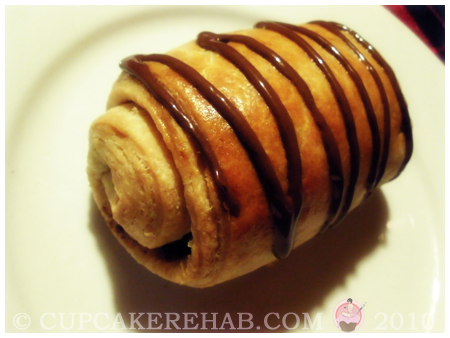 Roll it up the long way, so that you get a sort of cinnamon roll looking thing, filled with chocolate chips. Place seam side down on to a greased baking sheet and repeat until all the dough is used. Brush the tops with the egg yolk mixture and bake until golden brown, around 15-20 minutes. Allow to cool for 5 minutes on the baking sheet, then transfer to a wire rack. Serve warm. Mine took way longer than 20 minutes, but I made mine a bit larger and a bit thicker than normal, on top of the fact my oven runs at a weird temperature. They came out lovely, though, didn’t they? Of course, you can use any pastry dough you like; one with yeast, one without, one that has to be chilled overnight, etc. I just chose a shortcut version because I like instant gratification. You could even use Pillsbury refrigerated crescent rolls if you want. I prefer to use homemade, if I can, so I opted to pull together an easy pastry dough myself. And man- was it flaky & buttery! Perfect. I drizzled melted chocolate (½ – ¾ cup chocolate chips mixed with 2 tablespoons shortening, melted in a double boiler or in the microwave at 2 minute increments until smooth, put it in a disposable candy bag or Ziploc & snip off the bottom to make the drizzle) over the tops as well, but that’s up to you. They can be reheated in a low-temperature oven, but just keep an eye on them. You don’t want them to burn! And if you do coat them in chocolate drizzle, reheating them may be tricky. To make them croissants, just roll the dough thinner and cut into triangles, then roll them up from the long side and then tucking it up into the short end. A better explanation can be found in this YouTube video. You can also make them triangular and also fill them with chocolate. 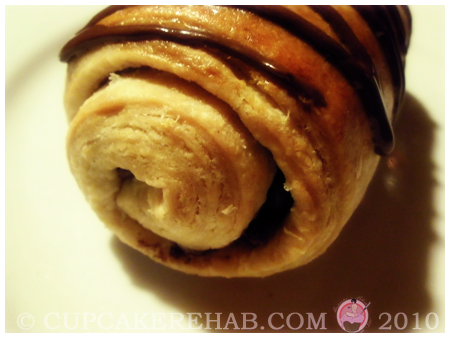 Another alternative is Nutella; just spread it on the dough instead of sprinkling the chocolate chips. 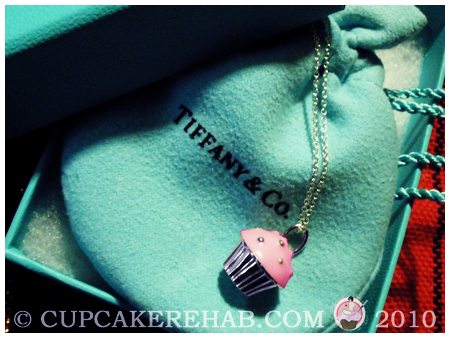 Tiffany & Co. cupcake necklace! 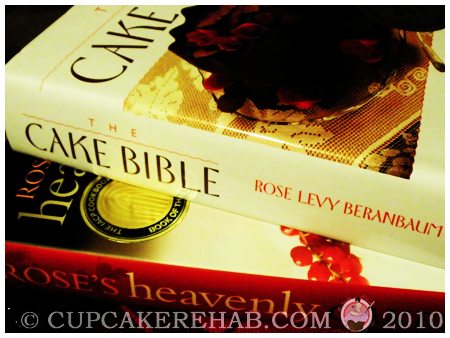 Rose Levy Beranbaum’s cookbooks, The Cake Bible & Rose’s Heavenly Cakes! I know, I’m a lucky girl. I’ve already got Post-It’s on tons of recipes in both books, & I’m now completely engrossed in the chemistry of baking (i.e. the proteins in egg whites & how they can be broken down, that cornstarch only thickens when it boils at 212° F & what exactly gliadin & glutenin are). And what better reading material for a Sunday/Monday where I was snowed in under 2 feet of snow? I hope that your New Year’s is safe and happy and healthy. I’ll see you in 2011; with new recipes, of course. Sorry, it was an involuntary capslocking. That’s so completely adorable. Happy holidays! Also, now I want a pain au chocolat, but my odds of finding one at 6:56 pm are… poor. Woe. I know, it’s super cute, right? I love it. And it’s small, so it’s not obnoxious, and it’s Tiffany, so it’s not cheesy. It’s perfect. Thank you Elizabeth, Happy Holidays to you, too! Aw 🙁 Boo! Work on him with those powers of persuasion! Yay! I received Rose’s Cake Bible too and have already broken the seal with a chocolate cake recipe! and soooooo jealous of the cupcake necklace! I made the white velvet butter cupcakes, but I’m gonna redo them because I think I might have left ’em in too long! for new blog owners please share. I understand this is off topic nevertheless I just had to ask. Hello there, There’s no doubt that your site might be having web browser compatibility problems.